A new study in the journal Nature Communications by researchers from the University of Bergen and Bjerknes Centre for Climate Research, Norway, and University of Oxford, UK, demonstrates that there is a clear potential for practical and useful predictions of northwestern European and Arctic climate based on the state of the ocean. "We particularly predict that Norwegian air temperature will decrease over the coming years, although staying above the long-term (1981–2010) average. Winter Arctic sea ice extent will remain low but with a general increase toward 2020", says lead author Marius Årthun, postdoc at the Bjerknes Centre for Climate Research. Time series of observed sea surface temperature along the North Atlantic Current and its poleward extension, the Norwegian Atlantic Current, show that anomalies progress poleward from the subpolar North Atlantic to the Nordic Seas with a time lag of 7-10 years. Higher Nordic Seas temperatures are furthermore associated with higher surface air temperatures and precipitation over Norway, and a reduced Arctic winter sea ice cover. Årthun et al. 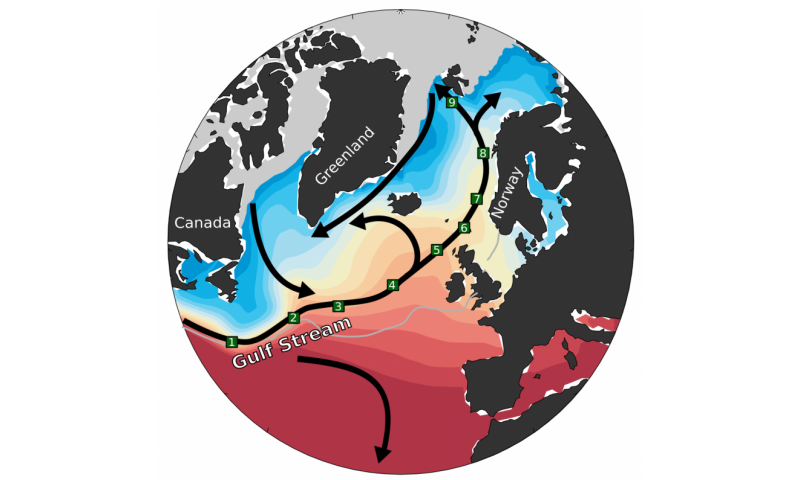 shows that a significant part of northwestern European and Arctic climate can be predicted by statistically exploiting the predictability arising from the poleward propagation of oceanic anomalies along the Gulf Stream and the strong co-variability between these oceanic anomalies and climate. Climate forecasts are essential for many societal applications and bridges the scientific gap that currently exists between the established fields of weather forecasting and projections of future climate change. It is commonly understood that the ocean, due to its large thermal inertia, is a major source of climate variability and predictability. However, several open questions exist on how and to what extent the ocean influences climate over land. This study detail a key aspect of climate predictability, and offers compelling evidence that oceanic variability exerts a strong influence on climate in the North Atlantic-Arctic region.